SCVHistory.com | Haskell Canyon | Crash of Light Plane Kills Pilot, Sparks 3,500-Acre Blaze, 10-28-1949. Crash of Light Plane in Haskell Canyon Kills Pilot, Sparks 3,500-Acre Blaze. Incident October 28, 1949 | News Reports. Canyon Homes Safe As Fire Held Back. Blaze, Hovering on Del Sur Ridge, Checked as Wind Dies Down and Residents Return. Los Angeles Times | Monday, October 31, 1949. Peril to homes of several hundred Bouquet Canyon residents was believed ended last night from the brush fire that in two days had swept over 3,500 acres in the mountains near Saugus. Early in the afternoon William V. Mendenhall, chief of the U.S. Forest Service in Los Angeles County, counseled the residents to leave their homes. At that time the flames were raging along Del Sur Ridge above the canyon homes. They were held back only by a strong wind. The Weather Bureau had said that by nightfall the wind probably would shift, letting the flames race toward the homes and cabins. Mendenhall said that in such an event he would be forced to order a general evacuation of the threatened area. The wind, however, died down. Meanwhile, Mendenhall had 80 fire fighters building firebreaks against the flames, and last night the residents of the area breathed easier. Mendenhall said the fire seemed to be making little progress. He said the northwest corner of the fire in San Francisquito Canyon appeared virtually under control but that fire fighters had been unable to get at the Del Sur Ridge flames. Mendenhall said that even when the men could reach the flames they had difficulty. Much of the brush is greasewood and, he said, "burns like gasoline." 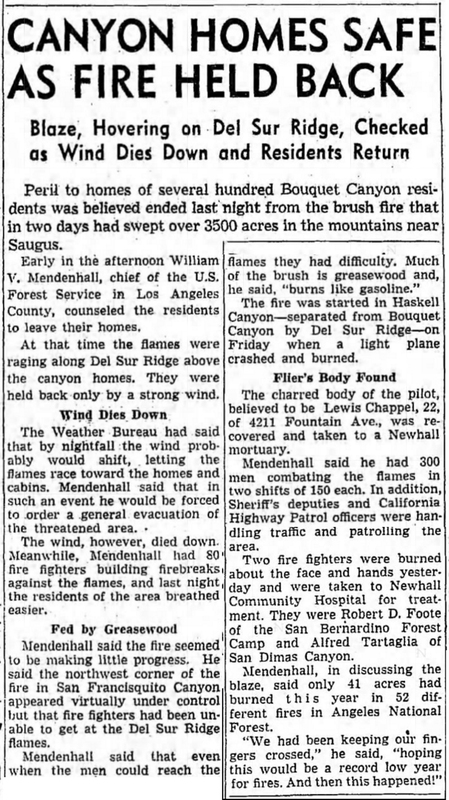 The fire was started in Haskell Canyon — separated from Bouquet Canyon by Del Sur Ridge — on Friday [October 28, 1949] when a light plane crashed and burned. The charred body of the pilot, believed to be Lewis Chappel, 22, of 4211 Fountain Ave., was recovered and taken to a Newhall mortuary. Mendenhall said he had 300 men combating the flames in two shifts of 150 each. In addition, Sheriff's deputies and California Highway Patrol officers were handling traffic and patrolling the area. Two fire fighters were burned about the face and hands yesterday and were taken to Newhall Community Hospital for treatment. They were Robert D. Foote of the San Bernardino Forest Camp and Alfred Tartaglia of San Dimas Canyon. Mendenhall, in discussing the blaze, said only 41 acres had burned this year in 52 different fires in Angeles National Forest. "We had been keeping our fingers crossed," he said, "hoping this would be a record low year for fires. And then this happened!"